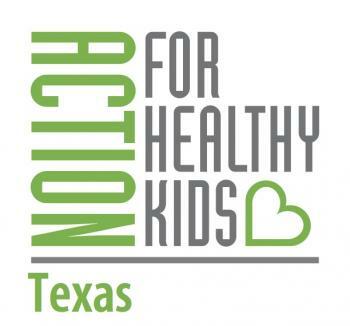 The mission of Texas Action for Healthy Kids (TAHK) is "to assure that all children in Texas are provided a healthy environment where they learn and participate in positive lifestyle behaviors, including good nutrition and regular physical activity." Form public and private partnerships among individuals and organizations that influence school health, environment and curriculum, as well as policies and practices that support healthy lifestyles. Help all Texas schools provide a healthy school environment where students learn and participate in positive lifestyle behaviors including good nutrition and regular physical activity. Age-appropriate and culturally sensitive instruction in health education and physical education that help students develop the knowledge, attitudes, skills, and behaviors to adopt, maintain, and enjoy healthy eating habits and a physically active lifestyle. Policies that ensure all foods and beverages available on school campuses and at school events are consistent with the Dietary Guidelines for Americans. Policies that improve physical activityopportunities for all students before, during and after the school day. Working with Department of Agriculture to formulate and gain support for a strong school nutrition policy; state policy implemented in 2004. Forming an alliance with Departmentof State Health Services to facilitate school health advisory council training, including how to use the school health index to assess school environment. Working with the Texas Education Agency to support quality physical education and activity through Coordinated School Health programs. Implementing a student led grant program that requires students to develop and implement programs that improve nutrition and physical activity on their campus. What a line-up! And what a project! A consortium of agencies, schools and corporations (see below) are working together to create the Wooten Park Nature Play Area. The project is funded by Austin City Limits Music Festival Grant Fund and Texas Action for Healthy Kids with many, many donations of time and service. Butterfly and wildlife habitat, trails, gardens and natural areas will join Wooten Park's playground area to provide outdoor classrooms for Wooten Elementary School. The nature play area will provide improved physical activity for students and give the community a 'mini-nature preserve' for use after school and on weekends.an outdoor classroom and nature playscape at Wooten Elementary School and Wooten Park. Click here to see the nature playscape design and read more about this project!